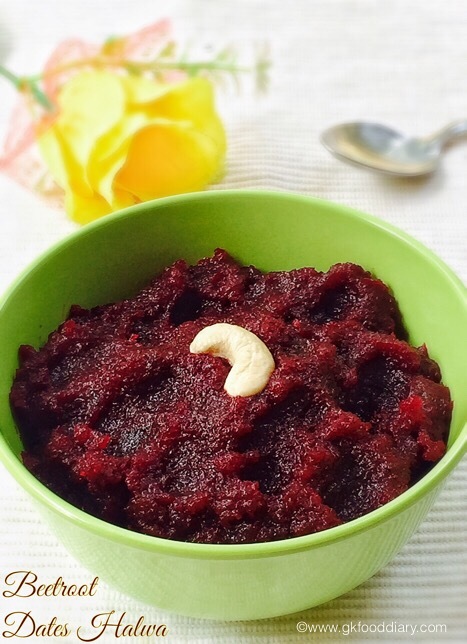 Beetroot Dates Halwa - healthy, yummy, iron rich sugar free halwa for babies with Beetroots and dates. Keep all the ingredients ready. Wash and peel the beetroot with a peeler. Chop them into cubes. Steam or pressure cook the beetroots using a steamer or pressure cooker with required water. In the meantime, remove the seeds from dates. Take the dates in a vessel and cover cook with water till it immersed level. Cook it for 5 minutes until it becomes soft. Heat ghee in a pan and add the beetroot dates puree to it. Mix well. Then cook it further for 5 to 10 minutes with occasional stirring. Switch off the flame when it becomes thick & the halwa leaves out of the pan.